The Giant, Virtual Acoustic Piano from Native Instruments. 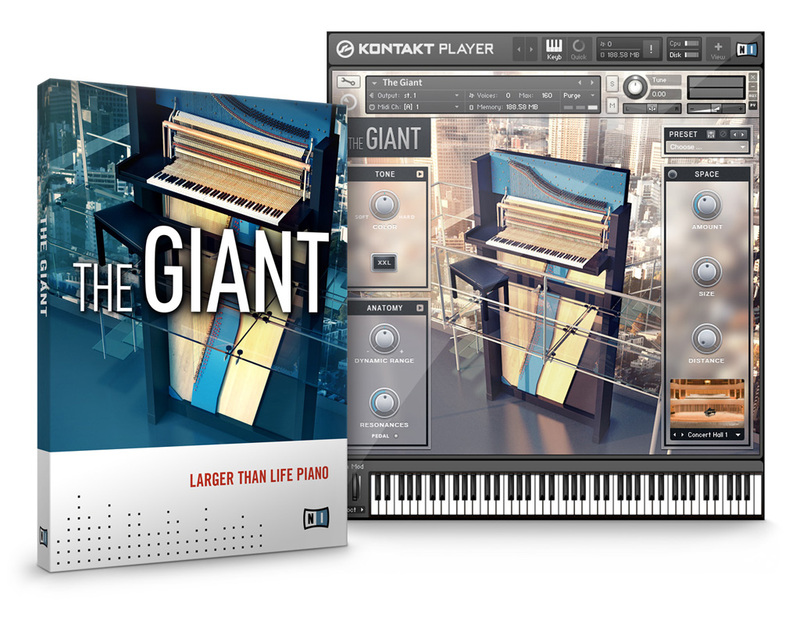 Native Instruments introduced The Giant, a new instrument based on the world's biggest upright piano. 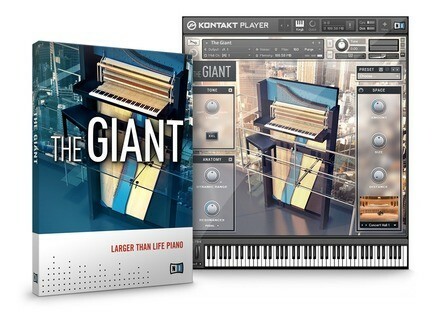 For use in Kontakt 5 or the free Kontakt 5 Player, The Giant features the sound of the Klavins Piano Model 370i, an instrument designed to "deliver a colossal sonic spectrum equally well-suited to urban pop projects, soft piano ballads, driving rock riffs and jazz numbers, as well as providing a separate 'Cinematic' version of the piano for darker, atmospheric projects and sound design." According to NI, this upright piano stands over three meters high and weighs over two tons, with a soundboard roughly twice the size of a typical 9' concert grand piano soundboard. Its sound forms the core of The Giant. 40 presets are included. The Giant comprises two separate instruments in one, each with its own graphical user interface and detail controls. While the piano sound of the 'day' version is suitable for a range of styles and genres, the 'night' version is designed to turn The Giant into a cinematic tool suited to atmospheric scores, sound design and avant-garde productions. With 'Tone', 'Color' and an XXL button, the 'day' instrument provides three basic control sections for adding sustain, space and character to the sound. The 'night' instrument includes unconventional, individually-sampled sound sources including overtones, resonances, plucked strings, release sounds and special techniques such as piano hits, kicks, sweeps or scratches. The physical elements of the instrument, including dynamics, tuning, noises, overtones or stereo image can be controlled via the 'Anatomy' parameters. Additional information on The Giant is available at www.native-instruments.com/thegiant. discoDSP Corona R4 discoDSP Corona R4 is now available for Mac + PC. Voxengo CurveEQ 3.1 Voxengo CurveEQ update version 3.1 is now available for download. Soundprovocation launches 50% Off Everything Sale Soundprovocation has announced a special offer: 50% off everything until May 31, 2012. The offer applies to all libraries.